It has been more than 20 years since Walt Disney Pictures released The Little Mermaid to rapturous universal acclaim and wide-eyed, astonished wonder. That film, a sumptuous, lovingly-crafted visual banquet, arrived at a precarious time in the studio’s history — at the tail end of a creatively bloodless string of derivative carbon-copy features (Oliver and Company, The Fox and the Hound and The Great Mouse Detective) and flat-out disasters (The Black Cauldron) — and brilliantly re-imagined the seemingly antiquated tropes and archetypes of the Uncle Walt’s Golden Age heyday, making them exciting and fresh once again. Dazzled viewers found themselves swept away on a bracing fantastical journey into the pixie-dust tinged childhood dreams of yesteryear, a treasured time when richl y-illustrated enchanted creatures loomed large and powerful in their impressionable imaginations. Unfortunately, despite providing Disney’s talented parade of animators and storytellers with a rejuvenated artistic spark — resulting in modern classics such as The Lion King and Beauty and the Beast — the rapidly approaching brave new world of the 21st Century proved mercilessly unkind to the studio. With 1996’s dawn of the full-length CG-feature, in Pixar’s Toy Story, the established Mouse House brand began to fall by the wayside, a victim of rising production costs and escalating audience apathy. By the time the cow-toon Home of the Range limped dismally into the marketplace and collapsed in an exhausted, clumsy heap, the grim writing was all over the wall; that classical hand-drawn Disney motion pictures were fast going the way of Bambi’s ill-fated, tragic mommy. 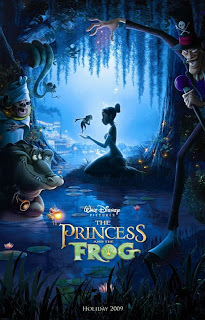 Now, five years later, the studio has regrouped and embraced their innate mastery for lush, 2D animation anew with The Princess an d the Frog, an ambitiously-conceived attempt to replicate the Mermaid effect and lovingly crawl back into the warm, nurturing confines of the ticket-buying public’s nostalgic hearts. 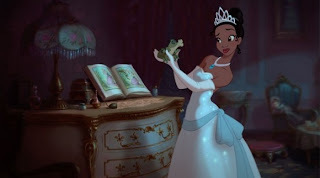 However, whereas the former film added a sophisticated edge and more epic sense of adventure to the time-worn formula, The Princess and the Frog too often feels inert and insubstantial; a blandly pleasant family-friendly bedtime story that’s far too similar to the many, many told before. 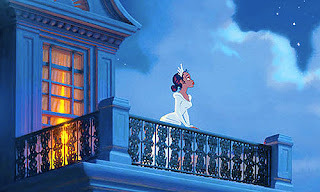 Set in Jazz Age-era New Orleans, opens on Tiana (voiced as a child by Elizabeth M. Dampier), an idealistic young African-American girl, whose mother works as a seamstress for the impossibly wealthy “Big Daddy” La Bouff (John Goodman), a big-hearted buffoon who do tes endlessly upon his spoiled blonde southern belle daughter — and our protagonist’s closest confidante — Charlotte (voiced as a child by Breanna Brooks and, as an adult by Jennifer Cody). Returning to her modest home after an evening spent enraptured in fairytales with her bubbly friend, Tianna wishes upon the North Star that one day her beloved father (Terrence Howard) and she will be able to open their own homey Cajun-style restaurant. 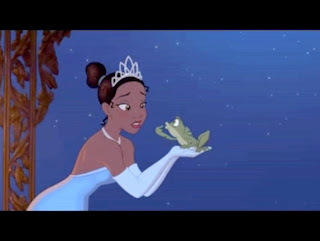 The film then flashes forward roughly 10 years, and Tianna (now voiced by Anika Noni Rose) is a beautiful and tirelessly hard-working waitress, slowly saving her tips with the hopes of achieving her now-deceased dad’s dream, and too busy for romantic adventures – despite the recent arrival of the dreamy, but irresponsible, Prince Naveen (Bruno Campos). Nevertheless, after the sinister “Shadowman” Dr. Facilier (voiced by Keith David, and resembling the menacing lovechild of John Waters and Little Richard) transforms the goofy Prin ce into a frog in a bid for power and wealth, Naveen finds himself brought into contact with the impatient young princess-to-be during an moonlit gala at the La Bouff residence, wherein she is inadvertently also converted into a croaking, amphibious state. On the run from Facilier, and in search of a cure, the two hopping heroes escape into the swamps, encountering new friends and foe alike, and slowly growing to realize that their hostility towards one other may be masking something far, far deeper and tenderer. 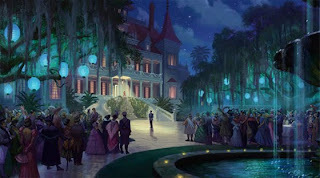 As a template for an animated fable, there’s nothing wrong with the set-up for The Princess and the Frog. Tianna comfortably follows in the well-worn glass slippers of many of Disney’s more recent headstrong, independent-minded heroines; doe-eyed and graceful, but containing enough of a sarcastic edge to make her an engaging and relatable presence. She makes a good sparring partner for Naveen, who is forced to make the most significant personal changes over the course of the film. 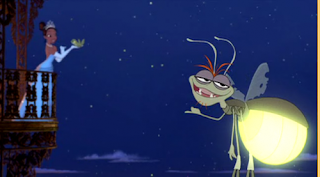 If only writing/directing duo Ron Clements and John Musker — the masterminds behind The Little Mermaid, along with Aladdin, Hercules and Treasure Planet — had mined this winning relationship for more than biting quips, snark and a pai nfully musty romantic reveal. Even more frustrating is that the two bickering prospective lovers are quickly overwhelmed by a succession of goofy and broad supporting characters, including Louis the trumpet-playing Alligator (Michael-Leon Wooley), old voodoo priestess Mama Odie (Jenifer Lewis) and the Cajun firefly Ray (Jim Cummings), who are all cut from the same cloth as Timon and Pumbaa, Sebastian, Genie, et al., but poorly thought-out, flat and tiresome — like bland escapees from one of Disney’s lesser by-the-numbers efforts — and only serve to instigate dull action beats and witless comedy. Heck, even the wonderfully creepy villain Facilier — who has a nice unsettling song number, a great vocal performance from David and a superbly wicked and intimidating design — is given little motivation or much to do beyond commit evil for evil’s sake. Compared to hiss-able baddies like Scar, Cruella Deville or Ursula, we never feel the true extent of his menace and his final comeuppance, while appropriately spine-chilling and iconic, feels too extravagant and harsh for an under-developed character we’ve spent so little time with. 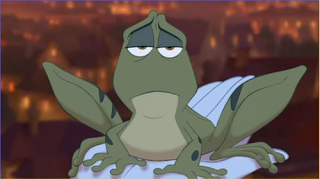 And therein lies one of The Princess and the Frog’s biggest weaknesses: it never feels like the filmmakers were able to figure out how to make the film feel remotely involving or original. Certainly, Disney animated features follow a fairly strict story structure, but the best of the studio’s output found thrillingly novel ways of reinterpreting and expanding upon the recognized conventions. This flick hits all the expected beats (Minus one key death that earns a glimmer of emotion, but would be a true powerhouse moment in a more confident work), offers few surprises and is often sluggish and trite. Even the majority of the Jazz-infused Randy Newman-penned songs are instantly forgettable and, as they come fast and often, gradually drag down the movie’s energy level. Only the villain’s aforementioned solo and a fairly rousing, gorgeously-staged number in Mama Odie’s shack come close to quickening the viewer’s pulse. Although it will doubtlessly entertain really young children, the whole project feels like a stale leftover from the latter days of Disney’s more luminous era, relying solely on the studio’s characteristically striking visual artistry to breathe life into its dusty lungs. 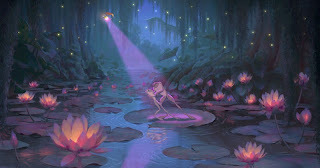 At an earlier point in time, The Princess and the Frog would probably be able to skat e affably by on its generic colorful sights and brand-value alone. But as a flagship vehicle for the intended relaunching of a historically-important, treasured cinematic art-form, it’s a major disappointment; a film content to halfheartedly hop for an audience yearning to soar.